One of the less widely known stories of World War 2 is that of the Germans who actively defied Nazi rule by taking up arms against their countrymen and the might of the National Socialist war machine. From the time of the Nazi ascension to power in 1933 until the end of the war a dozen years later, some 10,000 Germans and Austrians, many of them Jews, aided the British Government in bringing about the downfall of Nazi rule. Many risked torture and execution by acting as spies, double agents or intelligence officers, and a large number of those who fled to England, having already escaped the horrors of Hitler’s regime, chose to go back into occupied territory to fight on the side of the Allies. 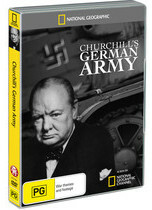 Through a typically adroit combination of personal testimonies and dramatic wartime footage, Churchill’s German Army tells the stories of four such men – Adolf Hezberg, Klaus Adam, Willy Hirschfield and Horst Pinschewer – who risked their own lives to volunteer for the British armed forces. To more easily pass themselves off as British they adopted the aliases by which they are still known – Bill Howard, Ken Adam (who has since been knighted), Willy Field and Geoffrey Perry – and set off to fight against, in some cases, former friends and neighbours. To this day the four men meet up each month in London, where they each live, to reminisce on the time they, as ‘friendly aliens,’ joined the ranks of Churchill’s German army. It’s a tremendously moving tale, and the bravery and stoicism demonstrated within truly inspiring. Highly recommended for history buffs, and those who like their WWII docos kept short, sharp and to the point. The quality of the footage necessarily varies due to its age, but on both the contemporary and vintage fronts the image is clean and sharp throughout. The producers have sourced some excellent shots of the D-Day landings and other iconic moments of WWII, and the 16:9 presentation is effective. The only audio is a perfectly acceptable English DD 2.0. There are no subtitles. Included as an extra is Untold Stories of WWII, a bonus documentary that strangely enough actually runs longer, at 55 minutes, than the main feature. It tells the story of the Nazi occupation of Finland, Hitler’s thirst for the atom bomb and the stories of those who dared to undermine his regime in any manner possible. The print doesn’t look to have been restored and shows numerous artefacts, but the picture quality isn’t too bad overall and the story is an interesting one. All in all it’s a well-chosen bonus feature that both augments the main documentary and helps compensate for its modest runtime.